"I was going to make Jahal my next point of investigation, were I to find no leads in Zodanga," I said to Car Than, "but if you tell me the princess is not there, I shall believe you." "No. She is not there, Jor Komak" replied Car Than. "We do occasionally attack and raid vessels that fly through our territory, but I have never ordered an attack in the kingdom of Dar, nor would I sanction a raid against a ship that flew Darrian insignia." Turning to the helm of our little ship, he began to plot a course. "I do know where such pirates might go, however, after so successful a raid as the one you have described. If your princess is anywhere, she will be in the city of Daxor." Our flyer was much faster than the ill-maintained barge used by Borath Veck, and we were able to move at speeds nearly equal to three hundred miles an hour. Despite my suspicions, Car Than assured me that no tracking devices existed upon Barsoom that would allow the Warlord or his men to locate this ship without actually following it. I still took the time to examine my harness and equipment, just to reassure myself that my gear had not been tampered with. During the journey to Daxor, I was given my first flying lessons. I found the controls painfully simple, consisting of little more than a yoke to steer by with two throttles, one which controlled thrust, the other lift. A button on each throttle would allow me to lock the control at a particular value, thus giving the equivalent of cruise control. While not equipped with the complex auto navigation system first invented by Carthoris of Helium (a messy gear work contraption which astounded me, as I was never convinced of the viability of the babbage engine as a complex computing machine), the vehicle did have the inertial compass which was fairly standard, and which told you the direction and distance you had traveled in relation to any given point on the globe. As mars has little or no magnetic field, the magnetic compasses of our own earthly navigators are nearly useless to pilots here, and thus this instrument is as universal as the sextant was on sixteenth century sailing ships. The entire system was designed to be quite intuitive, having been perfected over long ages of tinkering and fine tuning. By the next dawn, I had mastered the rudiments of flight. On our third day of travel, Car Than handed me the yoke and gave me permission to indulge myself. Laughing, I warned everybody to strap themselves in, and then I dove for a rocky promontory I saw below. I had wanted to find out how well this vessel flew in stressful situations, and had thought that navigating the many twists and turns of the ridges and ravines I had observed might aid my learning. It was well that I had had this impulse, for as our ship dove, another rose up from a hiding place among the rocks and began to give chase! Car Than cried a warning to me, pointing to the device on the ship's prow. I told him it was meaningless to me, and he informed me that it was a pirate, very likely part of the fleet which had taken the Mistress! I examined that ship for a moment, comparing it to what I had learned of the airships of barsoom. It was wide and flat, a sky barge of the sort typically used by merchants. In times of war they were often used as troop transports and bombers, with some being retrofitted to act as gunships. They were not, however, very fast or maneuverable, which is why this one had attempted to take us unawares. I laughed again, a wild sound full of abandon. As soon as I saw that a warrior had done lashing himself in place at the bow cannon, and was assured that everyone was well fastened by straps and buckles, the main purpose of which in a fighting man's kit was for exactly this sort of emergency, I resolved to make their chase a costly one! We were already heading down into a small winding canyon as the pirate ship moved to intercept us, and as the gunner signaled his readiness a shell burst among the rocks as the raiders began to fire. A song on my lips, I opened up the throttle and sped down into the ravine, twisting and turning among the many rocks and hazards. The raiders fired shot after shot from their cannons, but we would not remain still enough for their weapons to be of any use. I glanced at the gunner beside me, who was white knuckled with fear at the piloting maneuvers I had been performing to avoid their bombardment. I shouted for him to aim the cannon skyward, and to be ready to open fire when I told him to. Gulping, he nodded, and I quickly pulled up on the altitudinal rudder while twisting the wheel, causing the ship to gyrate while soaring up and back, and finally over the enemy ship! At our speed they had no chance of repositioning their guns, and as I barked an order our one gunman fired six rounds into their deck, as he tried desperately to cling with his knees to a seat that was suddenly above him! I completed the loop, our gunman continuing to barrage their vessel, as explosions rocked their hull from every angle. Smoke poured from one of the battle barge's engines, and I saw her begin to list, as apparently one of the lifting reservoirs was damaged. As the barge began to sink, an exultant cheer went up from the crew, and I took our speedy little flyer away from the ravine into which the slower airship had already begun to settle. When asked how I had thought to attempt such a maneuver, I simply said that while I had never flown before, my people indulged in many games of skill which were meant to simulate combat conditions, and thus I already had the requisite coordination needed to fly under such hazardous circumstance. Car Than himself unfastened a platinum ornament bedecked with jewels of myriad colors and personally pinned it to my harness, praising my flying as the greatest act of desperate insanity he had ever born witness to. Unfortunately the ship itself was not in agreement with my mates, and soon after out encounter, the little radium engine began to sputter and cough. The stress I had put it under was too much, and we hadn't the tools to fix it. The little radium engine continued to stutter and choke for the rest of the trip, and we were forced to slow to nearly one quarter of our top speed, but somehow we managed to keep flying until we were less than a mile from the gates of Daxor. It took us a total of four nights and days to reach Daxor from Zodanga, fully twice as long as it ought due to the damage to our craft. It was almost midday when our engine failed us completely and we were forced to abandon the little vessel. We were all very sore and tired, the vehicle not being intended to be slept in and only little larger than an earthly speedboat. We did not have much food between us, the guards we despoiled being part of the regular garrison and thus only carrying a small emergency supply in their personal kits, and by the third day even careful rationing had used up our potable water. I did the unthinkable, from the point of view of my companions, and actually unbolted the large recoilless rifle from its mooring, throwing it and several belts of ammunition over my shoulder. It only weighed a hundred pounds or so altogether, and I had grown accustomed to daily labors involving much heavier loads, but it was still quite impressive to my new friends. So it was that we came at last to Daxor, tired, half dead from thirst, dirty, ill equipped, and dangerous looking. We looked so much like pirates we were admitted by the guards nearly no challenge at all, save a wager from their captain wanting to know if I could shoot that rifle or if I just enjoyed its decorative value. Grinning, I responded by hefting my manly burden and blowing several chunks out of the city wall, which caused a number of concerned citizens to draw their weapons and rush to the gate, thinking the city was under attack. "Dim Sum like big boom boom" I said in my well practiced mongoloid voice, idly throwing the cannon over my shoulder once more. "He's not very bright" commented Car Than to the captain. "You might wish to be more careful in wording your inquiries to him from now on." Jaw agape, the captain merely nodded as we strode past him into the city that was renowned as a den of thieves. The city of Daxor was unlike any other you are likely to see on all of Barsoom. It's closest earthly counterpart would be a shantytown. The city is built within the burned out shell of an ancient city of the same name, whose defenses and siegeworks remain strong, but whose houses and buildings were destroyed long ago in some now forgotten war. A few crumbling ruins still remain, but the thieves and ruffians who dwell here have neither the tools, skills, or desire to rebuild any of it. They pile broken slabs of masonry to form crude beehive huts, while others live in the ruined hulks of wrecked airships, or else in simple shelters of hide stretched over a framework of wood or metal. As it does not rain often on Barsoom, many simply sleep out in the open, wrapping their furs about themselves wherever they may fall. Only one structure remains standing in all of this ruinous rubble, the grim, foreboding tower the locals call the Palace of the Pirate King. Much of the activity in the city happens in the pits below, which are still of serviceable condition. The tunnels are divided into domains, each doled out to some chieftain or jed. The ruinous maze of rubble and ramshackle abodes belong to those who are not important enough to lay claim to some strata of tunnel, or who do not wish to be obligated to some landlord, or who simply prefer the fresh air and sunshine afforded by living on the surface. In Daxor, everything was a commodity to be bought and sold. The people of Daxor were all bandits and raiders by trade. Too disorganized to be called an army, they attacked and plundered any target weaker then they. In reality, this was little different than the normal state of affairs for Barsoomian society, as even the most peaceful and scholarly of red martian communities are in a near-perpetual state of warfare with other nations in their vicinity. The resources of their dying world dwindle ever more with each passing day, and the death of any one person leaves that much more to divide up among the survivors. The only difference in Daxor was that here the veneer of grace and chivalrous nobility was stripped away, and only the barbarism of martian life remained. Despite their savage and appalling condition, which I was sure would shock and scandalize most red martians, I quickly concluded that these were a good and friendly people, given to the same customs and etiquette as the people of Dar. I quickly relaxed my guard and took on my usual slightly goofy good natured persona, which had allowed me to avoid much trouble when walking abroad in Dar. I babbled happily in a broken form of english mixed with barely enough Barsoomian to make my intentions known. I hunched my shoulders and stooped ever so slightly, which also gave the impression that I was actually straining under the weight of my cumbersome long arm. I spoke in the soft quiet tones of a functional idiot, and paid no attention to the insults I might overhear from others. My benefactor seemed familiar to the people of Daxor, and his inquiries about a young woman who might have been brought to this place were not met with the least suspicion or hostility. I was an omnipresent shadow in his wake, listening to every conversation but seeming to understand nothing. I played with soraks and petted calots. I picked wildflowers and gave them to old women. In short, I quickly impressed all who met me with the idea that I was quite remarkably harmless. A day's investigation rendered no clues to the whereabouts of Mistress Kayla, but found me enough work to ensure that I and my companions could eat. As we sat under the makeshift shelter of a lean-to, one of my companions turned to me and asked, "Why do you do that? Shambling along acting like a great vast idiot! Have you no pride? What would this princess of you, were she to see you act in such a manner?" "She was the only one to see through the deception" I commented quietly, as I busied myself with cleaning and repairing the huge gun. "She looked into my eyes and saw a rational intellect, when all others proclaimed me an insensible brute. She showed me kindness, when all others heaped insults and abuse." I looked up at him, and saw a certain softening in his eyes. "I am a stranger here, and fighting will not gain me my objective" I said to him, as I began to clean the dust and debris from the barrel of the cannon. "If I act the fool, there is method to my madness. A harmless imbecile, much as like a slave or servant, is invisible. No one wants to see him, and after a time they forget that he is there. People say things in front of me they ought not to say, they do things in front of me they ought not to do. They assume that even were I to comprehend their words, I would have forgotten every bit of it by the next day, and so their secrets are safe. Were I to stand tall and straight as you do, and look every warrior in the eye with a challenging stare, I would find myself fighting fruitless battles for the sake of some archaic and meaningless code of honor, and I would be forced to defend myself from men to whom I owe no malice. I am no man of mars, and warfare ill becomes me" I finished, and silently put myself to the task of cleaning my gear. I said no more on the subject, nor did it ever arise again. The next day Car Than arranged to have an appointment with the jeddak of this place, the so-called "Pirate King". It was an invitation for him alone, and so I and the others loitered about seeking some entertainment until evening should come. I wandered away from the others into one of the market areas where I had made myself known the previous day, and wandered about happily picking the flowers that grew in the cracked pavement of the streets, using a spent shell casing as a vase to hold them. A toothless old grandmother smiled at me and asked where my keepers were, then took me by the hand to make sure I didn't get lost or into any trouble. She was well known in the community, the piratical equivalent to salt of the earth, and as she helped me search for my caretakers I had the opportunity to listen to a great deal of gossip. One snippet in particular nearly froze my blood, as a disreputable looking gentleman spoke briefly with her. "Have you heard?" he asked her, clucking his teeth as if at some small town scandal. "The woman taken by the Pirate King has refused his advances." "Oh, the poor creature" said the old woman sadly. "What will become of her?" "They say she'll be thrown to the wild banths tonight in the arena" he replied, shaking his head sadly. "No!" I exclaimed in my best idiot voice, furrowing my brow into a mighty frown. "That not right. No throw lady to banth." The old grandmother smiled comfortingly at me, and patted my head with her free hand. "You're quite right, little one" she said. She shook her head, a scowl on her face. "Out of the mouths of babes, as they say. Even an idiot can tell you that's not right." The codger gave a cackling laugh, saying to me, "Tell you what, son. The rule is, any man who can defeat all the banths gets to keep the girl. That's the law here in Daxor. You kill the banths, you save the girl." I straighten up at this news, a huge idiot grin on my face. "I save girl," I repeat, as if defeating a single banth were an easy thing to do, much less an unspecified number of them. "Var Karis you wicked thing!" exclaimed the old lady, utterly scandalized. "How can you go putting a thought like that into the dumb brute's head? Can't you see he hasn't got the common sense of a sorak?" I turned to Val Karis, who had the look of a man that fully expected to be pummeled by a handbag at any moment, despite the fact that the ladies on mars carried knives and daggers, and were quite proficient in their use. "How many banth?" I asked him, "and can I use gun?" The couple both stopped, and looked at the small bore galloper cannon thrown over my shoulder. She turned to him, saying, "that's a good question, Val. Are firearms allowed?" "I suppose it depends on how angry the Jeddak is with her" mused the old man, scratching at his chin. "There's no rule saying you can't go in with guns a'blazing, but there's no rule saying you can, either. If he's very angry with her, he's gonna throw a lot of banths into the pit, thinking no one would dare try to save her. Of course, if he's that angry, he's not going to allow you to use a ship's gun to kill them all, either." I straightened up, a mighty frown on my face. "Dim Sum is big dumb brute, but Dim Sum is also man. Dim Sum go save girl. Use gun, use knife, use bare hands too. Dim Sum no let girl be eaten by banth, or Dim Sum no man." The old granny smiled tearfully, and put one soft leathery hand on my left shoulder after the manner of martians who wish to express their abiding friendship. "You speak the truth, little one" she said to me, pulling me into her arms and embracing me. "No man should allow such a thing, even if it means his own death. You go save the girl, and may your ancestors guide your hand." Val Karis grinned lopsidedly at me. "You're not such a brute are you? Got a noble heart, at any rate. There should be more men like you." I glanced at Val Karis and said quietly, "If there were more men like me, Val Karis, there would be fewer wars and more fields despoiled of their wildflowers." As the old woman pulled away, her eyes wide with shock, I winked at her with an impish smile. "Its amazing what you hear when people think you can't understand them" I said to her in a quiet voice. "Thank you so much for your kindness, and for trying to take care of this poor dumb brute. Now, if you would be so kind as to point me to the arena pit, I need to see a lady about a tiger." The arena, as it turned out, was actually the courtyard of the Pirate King's palace. It was hemmed in on three sides by buildings whose portico facades formed perfect galleries for spectators, while the fourth side was a high stone wall flanked by two towers, from which competitors could enter the arena floor. The ground floor was walled off, allowing no access to the arena save by the towers, and a new entrance had been opened up in the side of one of the castle wings, making the courtyard unnecessary. The entire court was a rectangle approximately one hundred feet long and seventy five feet wide. The galleries were four stories high, although the outer wall was only some twenty feet, the tops of the towers being level with it. I was much chagrined to discover that firearms were not allowed, but I received some satisfaction in watching the guard stagger under the weight of my blunderbuss before laying it aside on a nearby table. A simple inquiry at the front gate informed me that any man arriving at the northern watchtower could compete for the right to claim the condemned as a captive slave, under the proviso of course that neither their willingness nor compliance were guaranteed. The rules were simple. The captive would be placed on a platform in the center of the arena. The platform would be raised to a height level with the outer walls. The banths would be let loose and the platform slowly lowered. All that local tradition required of me was to enter the arena and slay the monsters before they could get to her. The banth is a dangerous creature, one of the deadliest predators on a world where nearly everything tends to think of you as the blue-plate special. Its tawny coloration and bristly mane has led the Warlord of Mars to refer to it as the Barsoomian lion. Despite this appellation, it is a solitary creature for the most part, a nocturnal predator that refuses to share its kill with others of its own kind. 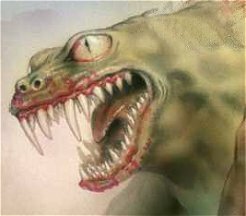 The average specimen is about fifteen to twenty feet long, with a lithe body supported by ten powerful legs, each of which terminates in mighty claws that can rip and rend even Barsoomian steel. They stand only six feet at the shoulder, but are able to rear up on their hindmost sets of legs to grapple with their prey, and thus can match the height of the mighty white apes or green warriors of mars. Thankfully, unlike the earthly lion, they neither climb nor leap, and so many a traveller has escaped their perdition by clambering to the uppermost limbs of some friendly tree. In his memoirs, the Warlord speaks of many encounters with these fell beasts, which even he has difficulty in dispatching. I knew full well that I was no Warlord, but a plan of rescue hatched in my mind that I believed had some small chance of success. The grim hour, when it arrived, had all the pomp and ceremony of Cecil B De Mille forcing a pirate captain to walk the plank. The victim was brought out, her hands bound, flanked by two burly guards that chained her to the platform. This part no one told me about. The platform was raised, and a great fanfare heralded the opening of the southern tower gate. 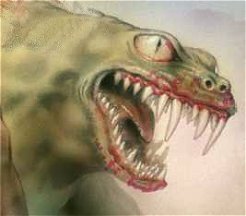 First one, then another, and another of these mighty carnivores prowled into the arena until in the end there were five great beasts circling around the base like sharks sniffing for blood. As the crowd cheered and screamed, the half starved animals tried to claw at the spectators in the lowers gallery, successfully snagging one warrior by his harness and tearing him apart. One seemed intent on trying to reach the top of the platform, and it continually jumped up, its claws scraping on the metal with a sound like nails on a blackboard. My heart leapt as the creature tried to get a purchase, and almost managed to clamber up onto the platform, but the guard at the gate held me back, saying it was not yet time. As the wild snarling beasts fought over the carcass of the fallen warrior, the trumpets sounded again, and a small flying palanquin surmounted by a throne of gold encrusted with glittering jewels floated down from the tops of the tower. It hovered at a level slightly above the platform, so that the Pirate King may pronounce judgment upon his helpless victim. My blood ran cold as I heard the voice of Borath Veck address my Mistress, saying "Kayla Zo, you have been given the singular honor of being allowed to become my princess! You have seen fit to spurn me at every opportunity, even going so far as to attempt to sell your life dearly with drawn blade. The penalty for such an assault is death, my pretty, death! But I am a just and merciful ruler, and the laws of this land must prevail!" As the one banth determined to reach the top of the platform began to scrabble and claw at the edges of the stage, his flying throne lifted itself a little higher and out of the reach of the massive monster's flaying claws. "I give you one last chance at preferment, Kayla Zo, before your fate is determined by the beasts below us. Beg the pardon of the Pirate King, and I shall forgive you, and allow you to live as my slave! Remain obstinate, and the laws of this kingdom shall hold sway." My Mistress did not flinch, nor dignify Borath Veck with even a glance. As he ended his speech, she turned to the guards at their post on the towers and called out, "If the flying ulsio is done squealing, would you kindly throw me to the banths?" 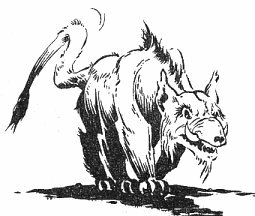 (for the edification of those who do not know the reference, the ulsio is a hideous rat-like scavenger that is a common pest in martian cities). Borath Veck went purple with rage at this, and made a signal to the guards. The gate before me dropped, and at the same time the chains fell off of my Mistress' wrists. I flew off like a shot, hot blood burning in my veins, making me see nothing save a crimson haze. My plan was gone, I was filled with nothing but hate. One mighty step put me at the foot of the platform, one bound launched me to the top. With my left arm I caught up Kayla Zo, as another bound launched me for the flying palanquin! He was now thirty feet above the platform and sailing for a balcony high up on the main tower, but my earthly muscles were more than sufficient to bridge the gap. I had no thought in my head other than to avenge my Mistress for all the wrongs he had heaped upon her, and that vengeance came in the form of one mighty right hook, which lifted him up out of his gilded throne and cast him into the arena below, where he did not even hit the ground before some wild beast had snatched him up and begun to rend his flesh. I did not bother to look back, but used my forward momentum to continue my movement, launching from the platform to the balcony I had seen. This time, as we sailed through the air, I let go of my Mistress and caught her by her harness, throwing her over my shoulder to better distribute her weight. I only barely reached the balcony, my outstretched fingertips just managing to hang on to the railing, but my weight, compared to the strength in my earthly arms was enough, in the reduced gravity of mars, for me to vault up onto the balcony and land there, face to face with a pair of guards who, in their surprise, were still in the process of drawing their guns to defend the life of their jeddak! I used the remaining energy of my landing to spin into a high kick, lashing out with the heel of my foot against the breastplate of the guard to my right. Caught just above his center of gravity, he was lifted up into the air, flew backwards, and caught his legs at the railing. I did not wait to see if he caught the edge or fell to his doom, I was already turning to face the one to my left, who had drawn his pistol and was taking aim. The balcony was small, only a few yards across, and so the guard was very close by. As he raised his revolver, I followed through in my kick to his comrade, and hopped forward to the point we were close enough to grapple. Praying that, if he fired, the bullet struck me rather than my Mistress, I reached out and snagged his wrist, twisting the gun aside and applying pressure to the tendon there, forcing his hand to go limp. He was thrown off balance by this, his right arm now bent at an odd angle by the turn of my hand, and with one fluid circular motion I hurled him over my shoulder, and right into his companion who had barely managed to clutch the railing before pitching over. I wasted no time to determine if they fell or not, nor to see if any more guards were coming. What has taken me paragraphs to describe was the matter of but a few moments, and even as I threw the guard, the crowds below were roaring with approval as their sadistic jeddak was being torn apart by his own executioners. Seeing an ornamental ledge above me, I jumped, just as the soldiers on guard in the towers below opened fire on my position. Had I hesitated in the slightest, I would have been caught in that deadly fusillade of exploding missiles! Instead, nimbly as a mountain goat, I sprang from ornament to ornament, clambering much as a monkey might, on my way to the square roof of the tower where I knew flyers to be parked, and from whence I might make good my escape. As I vaulted over the battlements of the tower, seven warriors wearing the metal of the pirate kingdom were already rushing with drawn swords toward me. Nowhere left to run to, I had no choice but to draw my short sword and face them. Setting Mistress Kayla on her feet, I caught her eye just long enough to say in my native tongue "wish me luck" before springing forward to meet the first of the warriors. As I had only a short sword against their long rapiers, a true martian gentleman would have switched to a short sword as well. Then again, a gentleman would have allowed me to fight mano a mano, rather than rushing at me en masse. Thankfully, while I have always had a certain nagging sense of duty, my ego was almost totally unfettered by concepts such as honor and fair play, so their lack of dueling etiquette really only balanced the scales somewhat. Closing on my first assailant, I stretched out my arm as if lunging with my sword. He took the obvious aggressive stance, relying on the superior reach of his weapon to stop my heart before I could reach him. He did not expect, however, for me to spin in a fantastic arabesque, knocking aside his rapier with my blade and then catching him on the chin with a high circle kick. I continued my movement, leaping over him as he arched back heels over head from the force of my strike to land on the roof behind, where my short sword caught him in the throat. I did not waste my momentum but tucked in to a forward shoulder roll, hurling my blade at one warrior while withdrawing the dead man's pistol form its holster with my other hand. As quickly as that gun was drawn two more men were dispatched, for even firing from the hip with my left hand, I could not miss at such close range. It was but a moment's work for me, as I rolled across that rooftop, to treat each man's head as the brightly colored bullseye at a county fair, and cause each to disappear in a burst of flame and red mist. Of the remaining three, two rushed at me with swords outstretched, while the last reached for his gun. I completed my movement by regaining my feet, tossing the gun to my right hand and then replacing it with a dagger for my left, which was done with the grace of a juggler. My pistol spat fire and the gunman's gut spouted blood, but the bullet passed through his body and struck the rooftop beyond, exploding a few yards behind him. The swordsmen pressed my moment of distraction, their blades each managing to draw blood from a minor wound. I withdrew before they pierced my vitals, and so their onslaught pushed me back to the edge of the rooftop. Agile as I was, their blades were razor sharp, and I was soon nicked in several places on my arms, thighs, and torso. I reached the crenelations at the edge of the rooftop and saw my chance. Taking a giant step backwards, I kicked off of the stony merlon and used it as a springboard to propel me over my dueling adversaries. As I landed, I lashed out with a foot, kicking one in the small of his back with such force that he bent over double, his spine making a sickening crunch before his already limp body hit the wall and dropped to the floor like a sack of meat. His partner I simply shot, as the man wheeled around to face me once more. His head burst like a ripe melon, but before I could press my advantage and make good my escape, I felt a massive pain in my leg as a report sounded from behind me. I had failed to consider the man whom I had shot in the gut, and he was intent on selling his life dear. I turned and fired, even as my knee buckled and I began to collapse. This time, my bullet struck the breastplate of his harness and the round exploded, scattering his head and limbs in all directions. Again, this battle took longer to describe than it did to enact, and even as I stumbled, I could hear the sound of more soldiers rushing up the steps to replace those I had felled. I turned to see my Mistress, standing at the edge of the rooftop, watching me intently, and I somehow found the strength to stand. Favoring my injured leg, I snatched up a new sword from a dead warrior before sweeping her in my arms once more and leaping for a small four man flyer that looked to be the fastest thing moored at this berth. A swift flick of the sword slashed through the mooring cables and as I finished the last of them, Mistress had already started the motor and we quickly began to ascend. As volley after volley of rifle and cannon shot echoed around our heads, Mistress opened the throttle of our flyer as far as it would go, and we shot into the open sky like an arrow. I cast about for a bow gun, and while I found no such weaponry, my search did divulge an arms locker from which I took a high power sniping rifle. I returned fire as best I could, seeking to disable the guns and engines of any ship which seemed intent on pursuing us. My rifle had a magazine of one hundred shots, of which I made satisfactory use of perhaps half before the chamber was empty. It was enough to disable two large gunships and to knock out almost a dozen small flyers that might have been able to match our speed. After half an hour had gone by, I scanned our wake with the telescopic sight on my rifle and found no sign of ships in close pursuit. I put the weapon away and began to examine my right leg, which I realized had an explosive bullet lodged within it, and was bleeding profusely. "Jor Komak, you are a wretched foolish insubordinate beast of burden" Mistress said to me, the first words she had spoken since I snatched her from the platform in the arena. "I think you forgot craven, disloyal, stubborn, impertinent, and injured, Mistress" I replied lightly, as I sought to staunch the bleeding of my wounds. "Do not presume to correct me, you lackwitted calot!" she reprimanded, as she locked the course into place and turned to examine the extent to which I was maimed. As she tended my injuries, she asked me, "I suppose you have some idea of where we are, then?" "No Mistress, I have no idea where we are, but I do know where we were" I answer her. "The pirate stronghold of Daxor lies roughly nine thousand, five hundred miles due south-southeast of Zodanga." "And I suppose that horrid orange paint is supposed to be some sort of a disguise?" she asked, as she bound and plastered the lighter of my injuries. "Why yes, Mistress, for I am as cunning as the darseen, which changes its colors as it lies in wait for prey" I replied, smiling at this rare chance at familiarity. "You are as stupid as the darseen, who sits and waits for nothing at all until it is eventually a dried up husk" she jibed, as she gave me an injection to ease my discomfort. "I wait only for your bidding" I told her then, and she stopped, and looked into my eyes. She seemed on the verge of speaking, but then hesitated. Quietly, I told her, "Let what can not be said, remain unsaid. I know not what lies in store for me when we return to Dar, and I would not have you render praise or condemnation until I know my eventual fate." The moment passed, and she turned once more to the task of treating my injuries. "You know nothing and speak gibberish" she told me. "Now lay still and rest. When the sun has gone down I shall try to remove that bullet from your leg." Many aspects of Barsoomian physics and chemistry astound me. Only their knowledge of psychology, aided as it is by their telepathic faculty, seems even remotely within the realm of what an earthly scientist might call reasonable. A perfect example of this is the so-called radium bullet, which I do not believe contains any radium in it at all. The name comes from that esteemed nephew of the Warlord of Mars who, in transcribing his story for the delectation of an earthly audience, struggled to translate the hieroglyph of Heliumitic writing which was used to name the explosive. This compound is unparalleled in that it is perfectly stable under any condition you care to name, but only so long as it is not touched by the least ray of sunlight. Artificial light, starlight, and moonlight are all acceptable, but the light of sol will trigger a deadly explosion. A few tiny grains of this ubiquitous explosive, lodged within the tip of a glass bullet, carries enough power to react with the force of a stick of earthly dynamite. Because of this, nearly all field surgery on mars happens after nightfall, to preserve the lives of patient and doctor. The trip to Dar was an uneventful one, thankfully, and we sighted her walls some twelve days after making our escape from Daxor. We were challenged by a patrol boat, which was to be expected, and a brief explanation was more than sufficient to answer why we flew a craft which bore the ensign of a house of Helium (a fact which neither of us were aware, as the craft was taken in the heat of the moment). The air was alive with ships, including a number of warships of new and impressive design. I felt a strange surge of pride to see my innovations, inspired by earthly war machines, so beautifully realized in these grand new ships of the line. "Have we been invaded?" Mistress wondered aloud. "I don't think so" I answered, pointing to the banners which they flew. "These must be the new ships built to replace those lost in the recent war." We admired the new warships for a time, until at last we came to the house of my master Kovas Morn, and once again I was obligated to return to the restrained formality of my life as a slave. There above the master's house flew a grand ship of impressive design, as much yacht as battleship. She was a mighty vessel, her decks of the finest skeel and sorapus wood, her hull detailed in gold and picked out in glittering jewels. I counted nearly a hundred gun ports on her, and from her look she could carry a full utan (regiment) of marines in her hold. I looked upon it in admiration, and as I did so, I heard my Mistress make a sound beside me that I almost took to be a quiet sob. Concerned, I glanced over, to see tears in her eyes before she quickly turned away from me. "I am so sorry, Jor Komak," she said in the quietest of whispers, "but what has been unsaid, must now remain unsaid, for all time. Like a mad fool, I had hoped that this day would not come, that some divine providence would turn it aside. Behold that nameless doom you spoke of, Jor Komak, when we fled the pirates of Daxor. Behold the proud flagship Vorator, which carries on her deck Suthor Raas, jed of Gohus, who is promised to be my husband." Stunned, I gazed in silence at the gilded warship which flew above my master's hall. That I had every warning of such a thing I should have realized, from the way that my masters had tried to keep the two of us apart after the festival of Bar-Darras. Even so, after having come so far, only one thought sprang to my mind, and though it was unworthy of me to say it, the words fell from my mouth ere I had any chance to stop them. "That is a very nice warship. I wonder why it's not out hunting for pirates." I fully expected, and in fact deserved, a harsh reprimand for my temerity, if not an actual cuff to the ear. Instead, I felt a soft caress, as my Mistress lay her head against my shoulder, her arm across my back. Her voice filled with sad humor, she quietly said to me, "You are a magnificent dullard, Jor Komak." As our flyer landed, we were received by servants, including my friend Norad Zek, who was grinning like a hungry calot, and Alizaron, dwar of the household guards, who raised his sword in salute to me as we landed. Word of our arrival had been sped to my masters by a courier from the patrol boat that had challenged us, and we were informed that we were to meet with them at the palace of the Jeddara in an hour, to give us time to wash and refresh ourselves. I was finally given a chance to shave and scrub the last bits of pigment which still left my skin a spotty orange color. My hair was close cropped, but no longer stubbly, from the fortnight of growth which the last leg of my adventure had afforded it. As I returned to the simple servants harness to which I had grown so fond, I realized that the games and obfuscations I had played at no longer suited me. While I was not a proud man, as Barsoomians took pride to mean, I was as rightfully a warrior as any of them. It was with this realization that I buckled my battered short sword to its accustomed place on my harness, and then added to my accouterments those metals and tokens which I had won, including the platinum ornament which I still prize as a token of my friendship with Car Than, prince of Zodanga. I was no O-mad ("one-name", literally an unblooded warrior, one without rank or recognition) any longer. We left at the appointed hour, accompanied by the normal retinue of servants and guards. The masters were at the Jeddara's palace already, we had been informed, awaiting our arrival. We were ushered in with all due pomp and circumstance, and as we entered the great hall a cheer arose from the assembled audience. I was startled to see Car Than and my other companions waiting for us, but then it dawned on me that we had not traveled at anywhere near the full speed that our craft was capable of. Our escape was so sudden that it would have been easy for my compatriots to disavow any knowledge of us, and thereafter to acquire the use of some flyer. They came forward to greet me just as Kovas Morn and some stranger whose metal I did not recognize came to greet Mistress Kayla. "Kaor, Jor Komak" said Car Than to me, placing his hand on my arm after the fashion of his people. "You look, I must say, far better now than when last we met." I grinned at my friend and returned his greeting. "Kaor, Car Than, prince of Zodanga. I feel, I must say, far better than when last we met." The stranger who accompanied my master scrutinized me as I spoke to my friend. I could not help but note the wealth of his trappings, the barbaric splendor of his appearance. He could be none other than my Mistress' intended husband. After saying my greetings to my friends, I turned to him and bowed. "Kaor, Suthor Raas, jed of Gohus. I am at your service." He picked himself up to his full height, an impressive six inches taller than myself. His look was half appraising, half challenging, as I greeted him. "You have a strange manner about you for a servant" he said to me, as if half daring me to speak out of turn. "Have I?" I asked him, smiling pleasantly. "Then I suppose I have. Far be it from me to contradict my betters." As I spoke, I saw a flash of laughter, quickly suppressed, in the eyes of my master and in the eyes of Kayla Zo. She turned immediately to me and cuffed me behind the ear. "You have the manners of an ape, you lack-witted calot! Keep to your place from now on!" I bowed immediately, saying "Of course, Mistress." Turning to Suthor Raas, I bowed again, and said to him, "forgive my earlier impertinence, sire." Kovas Morn regarded me for a moment, a hard look in his eye. "You seem ill suited to that metal, Jar Komak" he said, after a moment's deliberation. "Take it off." This, I was expecting. Having betrayed the trust given me as an orad, I could expect no less. Mistress seemed intent on taking up my defense, as did Car Than. As I began to unbuckle my harness, she turned to her uncle, saying, "If Jar Komak did wrong, it was done in the name of loyal service! How can you so reward one who willingly walked through fire to rescue me?" Car Than, too, seemed outraged that I should be stripped of my status, and appeared to be on the verge of saying so, when I stilled him with a gesture. "I did not act out of desire to be rewarded, my friend" I told him. "I acted as conscience moved me, and in so doing, I revealed long layed plans for escape which I had harbored since my master first took me into his house. For such treason, I can expect no reward." "For such treason," growled Kovas Morn, "you shall be made a free man!" "Hold!" cried a voice from the dias at the end of the great hall. "Hear my judgment, Kovas Morn, before you act!" Zamran Gauth, Jeddara of Dar and all her provinces, had risen from her golden seat and strode a few steps down to where we had congregated. Turning her piercing eyes upon me, the Jeddara spoke, declaiming, "Jor Komak, approach the throne of your jeddara." I did as she commanded, walking as far as the first step, and then kneeling before her, palms down on the floor, my head between my hands in an attitude of submission. She paused for a moment, using the power of her charismatic presence to fill the hall of her throne room, before addressing me. "When last we spoke, Jor Komak, it was my judgment that despite the service you had rendered to our people, you were, and were to remain still, a slave. That very night, you formented rebellion against your master, and fled the city to which you had sworn allegiance, wearing the harness of a free man! No slave may be permitted to act thusly, no matter what cause he may have had for his actions. It is my judgment, therefore, that you be punished for your crimes. You shall be taken to the hall of reflection, where you shall be hung by your wrists and receive thirty strokes of the lash, one for each day that you have worn the metal of a better man. After that time you may return to the service of your masters, to prove yourself perhaps one day worthy of the trust and love they have shown you. I have spoken." I was lifted off the ground by a pair of warriors, who began to drag me from the hall. Behind me, I heard the voice of Car Than, my friend, speak words of comfort. "Fear not," he said, "for I have been an intimate of the jeddara for many years now, and have won her confidence and trust. I shall speak to her on your behalf. You shall not suffer this indignity." I stopped, and stood, my earthly mass and muscles easily thwarting the guards who sought to carry me away. "You do not realize it, my friend," I answered him, "but in her wisdom the jeddara has done me a kindness. I have no reason to better myself, who has lost all hope for the future. My broken blade lies bloody at her feet." I then said to the guards, "Allow me at least the dignity of walking under my own power. Show me the way and I shall follow." As I did not wish my friend to see the grief which twisted my face, I did not turn to speak with him. Thus I had no way of knowing until much later that Suthor Raas and his intended wife were standing with Car Than as he spoke. Collecting what pride I had remaining, I walked in even measured paces down the long empty corridors of the royal palace, until we came to that place of public trial and execution known as the Hall of Reflection. As an aside, for the edification of those readers who are not familiar with the strange customs of my adopted people, I should perhaps explain the significance of my statement. 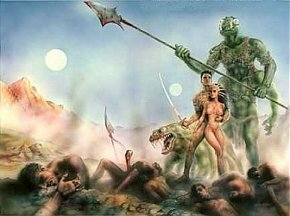 Among the red men of Barsoom, when a free man wishes to declare his devotion for any person, be they lover or liege, it is done by unsheathing their sword and placing at his or her feet. If this is acceptable, the sword is gently taken up by the person to whom the gesture is made, kissed, and then returned to the warrior's sheath. Tradition has it that, should the gesture be deemed unworthy, they instead take up the naked blade and plunge it through the undesirable warrior's heart, to save him from the humiliation of living with their rejection. Thus it was that my poetic allusion cut to the core of the matter of my wounded pride. I could not woo the woman I loved, and so freedom had no meaning for me. I recovered from the vicissitudes of the lash swiftly enough, and after was once again given a wide berth by all, allowing me time to brood upon the queer freaks of fortune. All around me, the house of my master was preparing for a royal wedding, and it seemed not a minute passed that I was not reminded of what I had won, only to lose. Finally the time came for my mistress to take her place on her intended husband's barge, and so forever disappear from my life. I welcomed this change in fortune, hoping that perhaps I could find forgetfulness in her absence. Without the constant painful reminders of her company, I could throw myself into my work once again, and perhaps make a name for myself as something other than dimwit and cuckold. As the final preparations were made, I took to sitting in one of the high towers, alone with my thoughts. Its many windows afforded me a view of that magnificent battleship which hovered above the gardens, and at night I would watch its gaily lit decks glitter and shine, alive with the light and music that would soon enough be totally lost to me. I was snapped out of my musings that last evening by the Mistress herself, who had come striding into my haunt with fire flashing from her eyes. "Get up, you sluggard!" she cried, throwing a silk pillow at me as she spoke. "You'll not be shirking your duties any longer. I have an entire bridal suite to pack, and that furniture is not about to move itself. Get on your feet, you sniveling lummox, you have work to do." Without another word she spun on her heel, and once again, I found myself following in her wake as though it were the most natural thing in the world to me. She was as good as her word, too, the entire suite of bedroom furniture belonging to her having been left for me to carry to her husband's warship on my heaving shoulders alone. When finally there was not anything left to remove, I having even been tasked so far as carrying her favorite ersite statuary to the hold of the ship, I bowed to her for the last time and prepared to take my leave. "Where do you think you're going, you vacuous git?" she demanded, as I turned to follow the other servants down the gangplank. "You're of no use to my uncle, you've proven as much. Your only value is as a beast of burden, of which he has far finer examples in his stables. Fortunately for you," she added with a mischievous smile, "Benvarius has removed the fingertips of several servants. The fact that you're too stupid to feel pain has saved you from being sent to the mines where you belong." From that time forward, I began a new life as my Mistress' devoted servant. I eventually managed to piece together what had transpired while I hung from my wrists as an object lesson in the hall of reflection. While I do not have all of the facts, and it has taken me some time to gather together what fragments I know, in epimethean reflection the events occurred thusly. In private counsel, Suthor Raas and Kayla Zo spoke concerning her captivity and rescue. They also touched upon that which is typically forbidden by martian etiquette, namely whether she had any feelings for her rescuer. For my mistress to speak one way or the other represented a kind of treachery which was abhorrent to the noble martian soul, but one of their flaws is an almost slavish devotion to honesty. When pressed, my Mistress spoke of conflicted emotions, for she loved me, but she also loved Suthor Raas. We two were of such different kinds that she had no means to decide which she preferred, if she preferred either over the other at all. One matter only weighed upon her mind, which might tip the scales in my favor. As I had spoken, so too had she thought. I was a slave, alone on this world, yet with some simple deduction and decisive action had managed to arrive at the correct place to find her, and did so in time to prevent her demise. He was a great and powerful monarch, jed to one of the wealthier outlying communities of Dar, with a fleet of vessels at his disposal. Her question, then, mirrored my own: why were the ships of her affianced lord not plying the skies in search of her captors? I do not know what answer he gave to her question, save that it apparently satisfied her. I do know that he offered to free her from her promise to him, if she preferred this panthan from another world. As she hesitated, he thought of another way. It had seemed that I had spoken truth, when I told Car Than that the Jeddara had done me a kindness, for by the ancient and mysterious rites of Bar-Darras, it would be possible for me to remain by my Mistress' side, but only were I to remain a slave. I did not know of this accord to which they had come, save only that I was to be allowed the sweet agony of remaining in my Mistress' presence, and whatever doubts her lord husband harbored about me seemed to be dispelled. The journey to her new home of Gohus was a short flight of only a few hours, after which I was set to work once again hauling large and cumbersome items from the ship's hold into the palace of the jed. The ceremony itself was to take place in the grand throne room of the jed's palace the week after our arrival, but such a ceremony was only a public formality, a way of declaring the union to the citizens of the community. That he had asked, and she agreed, was the binding commitment among the red race, and so she was lost to me long before I precipitously fled the hall of my master. I spent that week of preparation meticulously arranging the bridal bower for their coming nuptials, with the stroke of the whip my reward for the slightest failing. The night before that blessed event was to take place, I was summoned from my labors by one of the master's servants, who ushered me to a small bath chamber. I met a strange woman there, and was informed by certain signs that she was a priestess in the service to Bar-Darras, come to prepare me for a special rite. I was carefully bathed, every inch of me scrubbed until my skin fairly shone like marble. My body was anointed with oils while certain chants were sung and incense burnt, the one being hypnotic, the latter narcotic. I was garlanded with flowers from the pimalia bush, whose gorgeous blooms and sweet odor grace nearly every royal garden of Barsoom. So prepared, I was blindfolded and led carefully down some winding passageways, the twists and turns of which were so confusing as to leave me lost. The priestess and her servants lay me upon some couch that had been spread with silks and furs of the finest quality I had ever felt, and my arms bound to posts by chains of gold. Finally, before they left, more of that same narcotic was censed about the room, filling the air with its heady vapor. I lay alone, for how long I knew not, my senses reeling from the treatments and vapours. My sense of touch seemed preternaturally aware, and far from being rendered insensible by the drugged vapor, I seemed to be enhanced and made more alert by it. Thus I heard the chiming of the fine ornaments of gold which told me that a woman of high rank was passing this way, long before her slow, even, measured steps led her into my chamber. With glacial quickness, those golden chimes approached my resting place, until some person sat on the edge of my couch and lay a warm hand upon my heaving chest. She leaned close, and in my awakened state, I could smell the perfume in her hair as though immersed in it. I felt warm lips brush against mine, a soft exploring kiss which exploded across my sensory landscape like a blazing meteor. I did not need to hear the voice of Kayla Zo, my Mistress, to know it to be her, but her voice still sent a shiver of surprise through the whole of my body. "There is a tradition," she said to me in a whisper, "that according to the most ancient and sacred rites of Bar-Darras, a woman may sanctify her marriage bed by first sharing it with a sacred bull. Should that bull be also a hero or great warrior, so much greater the blessing his presence does bestow. There is only one requirement for this by the law and custom of our temple. So that the marriage itself may not be violated, it is an absolute requirement that the bull be a slave, and the property of both husband and wife, that they may both legally claim his blessing together." What transpired that night is for no one but myself and my Mistress to know, save that we explored each other fully and passionately, safe within the customs of law and blessings of tradition. When finally even my tellurian libido and the powerful drugs of the inner temple were no longer enough, we slept together in that bed which I had so painstakingly prepared, and I awoke that morning with her nestled in my arms. No servant entered to disturb us, and upon my Mistress' awakening, it fell upon me to make up the bed and perform all of those other simple tasks, to ready the room for when next it should be put to use. On that blessed night, when the same priestess who had prepared me as their sacred bull spoke the words which formalized their union, it was I who stood next to her, wearing the trappings of a consecrated heirodule, bearing a cushion of purple silk on which lay the golden chains of matrimony which once bound me to their nuptial bed. I was no longer a common household menial, but held a strange and rarefied position in the palace of the jed. The rite which bound me to my Master and Mistress also elevated me to the status of priest, and so I was accorded all of the deference and prestation due a member of the aristocracy. My trappings, while still after the manner of an orad, were finely made, white leather and silk decorated with gold and fine jewels. I was encouraged to continue my studies and in fact I became somewhat well known as a naval architect, my knowledge of earthly mechanics (limited though it be from my perspective) giving my drawings and plans a peculiar style and grace, not to mention speed and power, which began to rival the ships of Helium which were renowned the world over as fastest and mightiest vessels to ply the skies. For all of this respect and accolade, I was still essentially a body servant, given to attend the needs of my Master and Mistress as they saw fit. It was I who drew their baths according to their habit and liking, and it was I who attended to their wardrobe and toilet. Yes, exalted though I was, it still was I who polished the teeth of my Mistress' sorak. My duties demanded that I answer to other slaves of lesser status, each of whom was given domain over some aspect of the household to which I had to defer, if only to avoid unnecessary disruptions to either my Master or Mistress' schedule. As such I was a low, common menial, no better than a valet, but I was accorded status and honor higher than many dignitaries who came to sup at my Master's table. Somehow, this dichotomy of service and station was to me the most happy of conundrums, and I fell gracefully into the routine my new life demanded of me. Strangely enough, while I was not, in the colloquial terms of my adopted people, my Mistress' chieftain, I was still, in earthly terms, her lover (This is a distinction I am hard put to explain in the english language any better than I have already). I was also, after a fashion, the lover of my Master, a fact which made me rather uncomfortable. The intimate details of our relationship are not truly a matter I would wish to openly discuss, however some few facts seem germain to my tale, and so I may need to touch upon them in a brief fashion for the sake of completion. Because of my position within the house, I was, as I have said, a sort of body-slave. I attended to many of the personal needs of my Master and Mistress. I was valet, masseur, bath slave, bodyguard, and companion. So intimate was my place that often I was called upon to remain in the room as they engaged in their love-play, as a guard against assassins that may attempt to steal in to slay my Master the jed. While it was a cruel sort of post for me, it was in fact a necessary precaution, for assassins are as thick upon Barsoom as thieves and pickpockets upon Earth. That I was their sacred bull meant that I could remain in the chamber with them without breaching custom or decorum, and so my liege was able to give himself over completely to his princess. My mistress remained as scornful as ever, forever calling me dolt or lummox. That these were terms of endearment became quickly evident to my Master, who was too chivalrous a soul to ever use such epithets himself. As so often happens when I have befriended some soul upon Barsoom, he came to me one evening and asked why I was so willing to be insulted in this way. My explanation was a lengthy one, variations of which you have heard already in this tale, but for my Master the jed I explained myself more plainly. That she called me imbecile was a joke between us, for when she had met me I was considered an imbecile by all and sundry, she being the only one with perception enough to realize that a strange conformation of deformity and linguistics had provided a barrier to my intelligible communication. As no mere unkind epithet was sufficient to arouse my ire, that occasionally her uninformed guests also called me such things only served to heighten the amusement between us. He furrowed his brow at this information and told me, as is so often the case among my friends, that my methods and motives were unfathomable to him, but if this passed for humor among the men of Jasoom, he would not debate the fact. In actuality it was quite apparent to all and sundry that my Mistress had only the height of regard for me, however she might choose to word her affection. Very often, as I waited upon her at the table, she would pluck some morsel from her plate and insist that I try it, which, while not actually a breach of etiquette in the ways of martian table manners, was most often reserved for newly hatched children and favored pets. When I was at rest she would often call me to her side, that I might sit at her feet as she embroidered or listened to music or poetry. As I lay there, listening or reading some manuscript, she would from time to time place her hand upon my shoulder or back, or might perhaps run her fingers through my hair. There were times in private when her jests took on notes of almost barbaric cruelty. It was not unheard of for her to seclude me away from all others and take me up in some passionate embrace, only to take her pleasure from me and leave me in a mad state of desire. Once, when I protested my need, she gaily informed me that she was done with me, but that I might amuse her further by calling upon the slave master who dwelt in the pits of the palace. She seemed actually surprised when I found myself taking her at her word, submitting to the pain of the lash until she protested that she was satisfied. It took nearly twenty strokes before she so halted my castigation. It has been noted that valor and bravery are the finest ideals of the martian race, and that their highest acclaim is reserved for the conquering hero. I have found that this is not quite so, for often laurels are heaped upon the fallen who stood against a foe mightier than they. Many are those who are remembered in reverence for having stood in the way of the blade of the Warlord, whose prowess is so well known that no sane man would do such without just cause and passionate reason. So it was that a strange sort of laurel was heaped upon me time and again for my servitude, as my fellows began to see the lengths to which I might push myself in the service of my Master and Mistress. The dedication I gave evidence to, my willingness to undergo degrading tortures and shameful humiliations for the sake of my Mistress' amusement, became a source of renown for me, just as my trials in the pits of Bar-Darras had done years before. Honor and obligation have their place in the martian heart as well, and after a time, I found myself being approached by artists, wishing to capture the image of me kneeling before my Mistress as an expression of the highest ideals of duty and self sacrifice. I was my Mistress' constant companion, and as she was often in the company of her royal husband, I found myself frequently in the company of many lofty souls. Princes, jeds, and other aristocrats became well known to me, although of course they infrequently spoke to me personally save to arrange some appointment with my Master, or more often as a short polite greeting. The one exception was of course my friend Car Than, who not only called upon me frequently for the pleasure of my company, but also to solicit some advice or opinion regarding the construction of his fleet, as he was nearing a point where his partisan army might well be able to re-take Zodanga. I found myself falling into the role of military advisor, which I found a bizarre turn of events. My time on mars had inured me to the almost casual level of violence perpetrated by her peoples, and while my personal ethics dictated that I not fight save in the defense of my Mistress, I soon found the intellectual exercise of strategy and campaign to be highly stimulating. I had designed for my friend a sort of warship which I called the "sky fortress", for it was designed after the fashion of the American superfortress bombers which flew during the second world war. Its cabin was closed and completely pressurized, which is common to most aircraft on Earth, but the Barsoomian prefers to have the wind in his face when he flies, and nothing is to him more invigorating than to see the vast expanse of the world rolling away underneath him. That the Sky Fortress was pressurized, however, allowed it to be flown at altitudes far in excess of the so called "death limit" where aviators would lose consciousness from the lack of breathable air. As much warfare was fought by Barsoomians by dropping explosives or soldiers onto lower crafts, the ability to remain at stratospheric heights was a major tactical advantage, and one which my friend wished to make use of against the forces of Helium. The Sky Fortress had other tactical advantages as well. Like many of the newest ships of Dar, it used a simplified form of jet propulsion, where laser energy was used to heat air passing through an intake, thus expelling it with great force to generate thrust. The use of simple ramjet technology was applied by the navy of Dar as an expedience, owing that it reduced the amount of mechanical wear on otherwise costly engine parts. In the case of the Sky Fortress, however, it was a major design feature, meant to give the craft a level of maneuverability and acceleration far in excess to anything flown by the pilots of Helium. Even in those rare cases where gun batteries were set on rotating mounts, gunnery among the red men was an inexact science at best, and a swift moving, high flying craft could well deliver its payload and be past the horizon before gunners could draw a bead upon it. Such tactics were common to the earthly military, but represented a wild new innovation to mars, and one which gave potential victory to my friend. Somewhere in my heart, I knew this intellectual exercise would return to haunt me. That violence begets violence is a caveat by which I have ever lived my life. Even so, Car Than seemed to me an almost romantic figure, his devotion to the city of his fathers bringing to mind some forgotten son of Priam, seeking to take the battle for Illium to the very doorstep of Agamemnon. I had seen the hollow eyes of the people who dwelled in Zodanga, and that bleak despair had moved me. I was convinced, perhaps incorrectly so, that the Warlord had tried to be a just overlord, and that Mors Kajak, the conqueror of and liege to Zodanga, had undergone great pains to rebuild that nation and to return its people to some semblance of their normal routine. It simply was not possible, after more than a thousand years of war and feud, for the conquered people of Zodanga to gracefully bow to their ancestral enemy. Such a circumstance might change with time, and the new Zodanga adjust to being a satellite state of mighty Helium, but veterans of that century old war still haunt the world as panthans and rebels, and children still sit at home awaiting the return of a father or brother that they had lost in the course of hostilities. Such a rift is not swiftly repaired on Barsoom, where the people remain young and fair for many centuries, and more often die of violence than of age. It was during a visit by my Master and Mistress to the Jeddara of Dar that my foreboding manifest itself in all of its dire glory. As they sat at the supper table, engaging in pleasantries and small witticisms, a messenger came to the Jeddara and whispered in her ear. She excused herself from the table and went with him, and thereafter was gone for a time. As Jeddara, she was often called upon to deal with some pressing matter or another, and so no one gave her departure any thought. She returned, some minutes later, with a look of dark concern on her face. "The secret navy of Car Than has been set upon by forces loyal to Helium. The entire city of Jahal has been leveled, and with it nearly a thousand ships and a hundred thousand warriors destroyed. The Warlord has divined our collaboration with Car Than, and has declared the placement of an enemy force so close to his domain an act of war. Even now, the ships of Helium are moving against us. Alert my generals and send word to all the provinces. To arms! My Master immediately departed aboard his flagship to muster the forces of his army. He left me to remain at my Mistress' side, charging me to defend her above all other things, save perhaps the Jeddara herself. I bid him farewell as he departed, and then armed myself with those weapons with which I was now quite proficient, but still did not normally carry as a matter of personal preference. 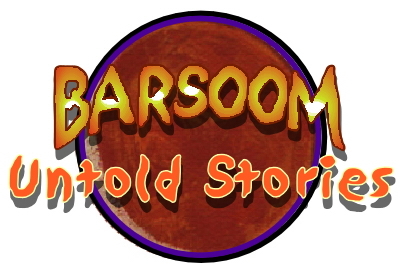 As nearly every fighting man was being mustered for the coming war and siege, I was gathered into an auxiliary of favored slaves and fighting women, who normally did not do battle according to the custom of Barsoom, but who formed the core of a home guard meant to defend the city and palace of the Jeddara from invaders. The following weeks were filled with tension, as I drilled with the other auxiliary members and met frequently with the Jeddara, who seemed intent on bringing to bear any possible advantage that her artisans could erect. She had read my now long forgotten proposal for a sort of magnetic mine, set to hover at a given altitude by means of the lifting properties of the mysterious eighth ray, and began to ask how quickly such a thing could be perfected, and how effective would it be as a means of defending the city. I warned her that it was a limited defense at best, as the mines were in no way concealed and thus could be easily destroyed by cannon fire. A few moments of thought, however, gave rise to a related concept, which I quickly outlined for her. Using a sensitive sort of magnetometer it would be possible to tell when a large vessel passed overhead, the wonderful methods of Barsoomian technology easily overcoming some of the relevant problems of calculating whether the ship were nearby but to the side versus overhead but extremely high up. It would be possible, therefore, to use this sensing system as a means of triggering some cannon or mortar, to fire upon the ship as it crossed the warded area. Such a weapon might be buried or otherwise camouflaged, creating the equivalent of an earthly mine field. My proposal met with her approval, and I was sent to her savants to determine the best and fastest method of erecting such a barrier. To these savants, I also asked about the earthly concept of the 'electromagnetic pulse', which could be used to disrupt communications equipment and other forms of electronics. While such devices were not used by martians to any great extent, the means of levitation which lifted their warships off of the ground was, to the best of my ability to comprehend it, electromagnetic in origin. Thus, if a means of disrupting the eight ray artificially generated and stored by these ships were found, it could be used to cause hostile vessels to sink or crash, effectively neutralizing them as a threat. This idea was for the most part ignored, save by Tjem Vor, who once had served as an assistant to Phor Tak, the mad scientist who had created diabolical weapons for Haj Ossis, the now deceased Jed of Tjanth. Tjem Vor hed grown fearful of the mad jed, who delighted in tortures which might make Torquemada blanch, and so he fled from that far-off land, to eventually come to Dar, where he has served the Jeddara ever since. "Such a principle was the guiding discovery behind my former master's disintegrator," he confided to me, "a weapon of terrible power which caused any metal touched by the ray it generates to evaporate, broken down to its component parts. I was not privy to the method of that weapon's manufacture, else I would willingly create it for the Jeddara, whom I know to be of such honor that she would never make use of it save in the most dire of extremity. I was there, however, when he found the means of disrupting the binding principle, at least under laboratory conditions, of what he termed the "tenth ray", which holds matter together. The frequency of each sort of matter has its own unique oscillation of tenth ray energy, and he had only begun to search for the unique frequency of certain common metals when I saw and seized my chance to flee from Tjanth. From what you have described, the principle of disrupting the eighth ray would be no different from disrupting the tenth ray, and perhaps simpler as the correct oscillation would be far less laborious to discern." "Find such a principle," I told him with a smile, "and I shall personally heap upon you what treasure I have, even to the very harness I wear."